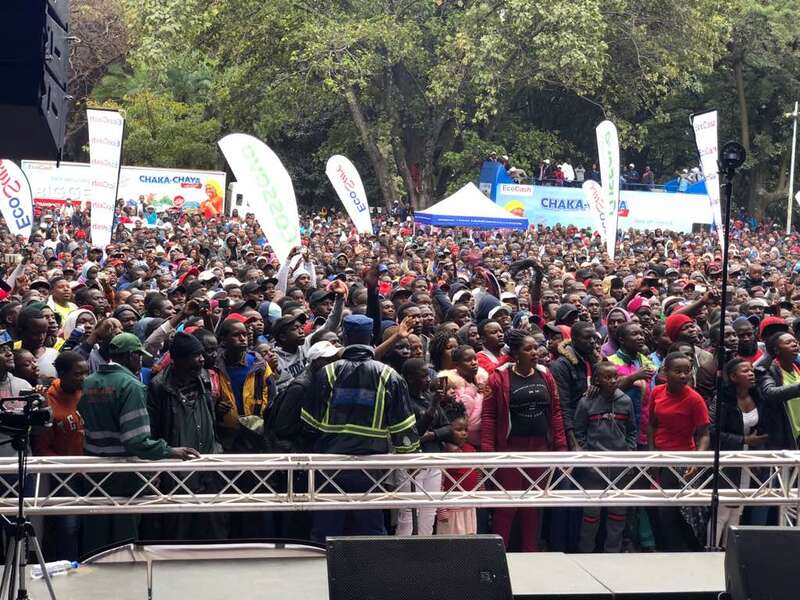 The final draw of the million-dollar ‘Chaka-Chaya neEcoCash’ promotion was held in the capital’s Harare Gardens at the weekend, drawing a bumper crowd of over 12 000 EcoCash customers that braved the cold weather to come and witness the curtains coming down on what has become one of the biggest promotions in the country. At weekend’s draw – the third and final public draw – dozens of lucky EcoCash customers walked away with several prizes, among them a brand-new Isuzu vehicle, won by Misheck Cephas Mupandawana, three residential stands (won by Charles Muchekwa, Tobias Matika and Chenjerayi Ndatsitsikwa), 15 cows, 80 goats, and a trip to Cape Town – which went to Manuel Khumalo and to Cassidy Kagore. Speaking at the draw, Cassava Fintech Zimbabwe, CEO Eddie Chibi congratulated the winners and thanked all EcoCash customers for their participation and support in making the promotion a huge success. “I would like to take this opportunity to thank all of our EcoCash customers for choosing us and for transacting with us,” said Chibi, clearly touched by the public’s interest in the promotion, whose tag line was ’the more you transact, the more you stand the chance to win big with EcoCash’. And win big they did, with prize winners distributed from different parts of the country, as far afield as Bulawayo, Kwekwe and Mutare. The draw was held in a carnival atmosphere, featuring popular radio Star FM DJs Phathisani ‘Chibaba’ Sibanda and KVG (Kudzai Voilet Gwara), along with some leading contemporary music artistes, among them Winky D and Andy Muridzo.